What comes to our minds when we speak about uniform? A kind of childhood memory. It could be our uniform as a kid. A khaki one. Shirt + shorts first. Then, as we grew older, the shorts grew longer to become pants. It could also be the British kids' uniforms. Or those from Harry Potter. Something strict and rigid in every way. Something used to erase differences, to make us look alike, to disappear behind a group. This idea of melting into the crowd reminds us of the Maoist costume that everybody wore in order to create a single Chinese people. It is also the uniform at work that says who you are as a worker. What kind of job you do. What kind of social status you have. From the overalls of the working class to the perfectly tailored suit of businessmen. The uniform defines who you are and where you come from. But this idea of uniform is not only a way to compel, it can also be a way to express oneself, it is the expression of one's own style, a way to present oneself to the world by saying Look at who I am no matter what you could think. Uniform is not always someting nefarious, scary and dangerous. You have to step back to see what lies beneath, what can be the understatement (there is always an understatement), to see that it doesn't have to be taken litterally. As Rei Kawakubo, the designer and creator of Comme des Garçons, said in The Expressionist Issue No 249 in November 2004"[the uniform] has been worn over the ages, it's comfortable to wear, and then based on that historical shape you can make something that is totally new but which also has the authenticity of being old. What I find tasteful is something you can wear and wear over and over again, so often that it becomes your own and when it becomes your own, your sense of style is expressed. That's why I've always been interesting in the concept of uniform: because it's worn over and over. Then the way you wear it makes it your own statement." 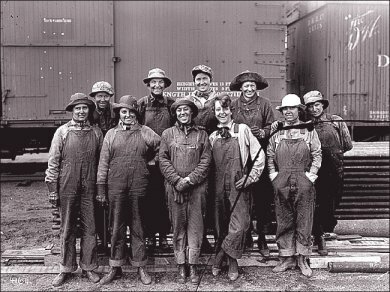 If we take the example of denim, at first it was worn by American miners during the 19th century, then by workers in the Car industry during the period of the Great Industrialization because it was a very tough and raw material. 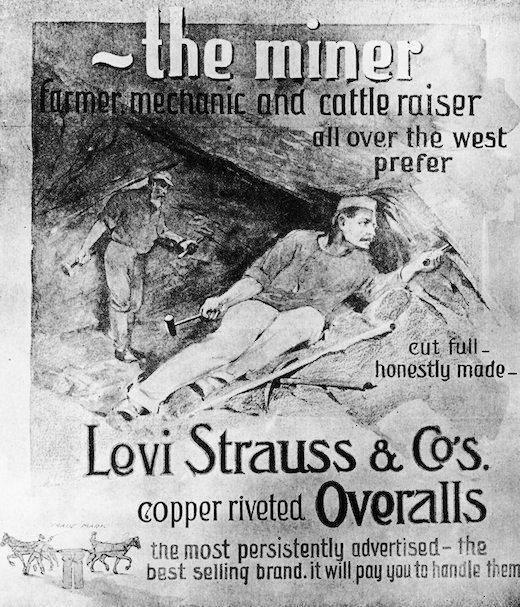 Then, Levi's started selling it as a plain garment in the middle of the 20th century, was worn by bikers, rockers and middle-class Americans. It democratizes. It became a material and an object associated to an everyday piece of clothes and it is unconsciously accepted. A fashion object reinterpretated, painted, used, handled roughly by designers creating different shapes, colours. 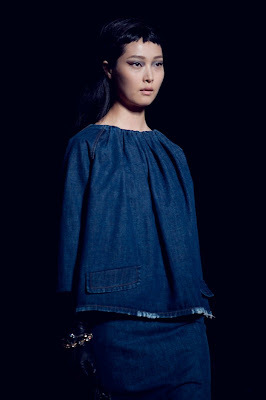 Denim is now a standard, a modern uniform you could find all over the world, from the fashion districts of London or New York to the Australian Bush, from the ranches of Texas to the streets of Warsaw. Always in this idea of a vintage denim, a mix of new and old, something recycled, HEDI SLIMANE with his first Menswear collection for SAINT LAURENT PARIS has reworked his favourite denim piece (already in his Dior Homme collections) i.e. 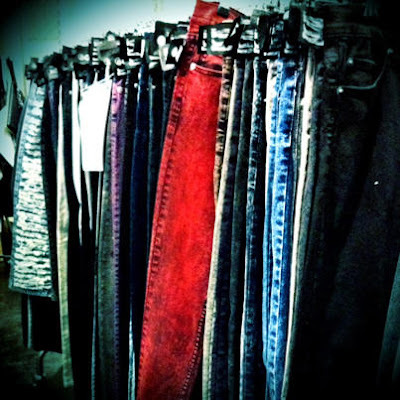 the skinny jeans, his favorite gimmick. Using a grunge/unisex styling, Hedi Slimane has made new with old and proposed an androgynous silhouette that even seems to revive Kurt Cobain. 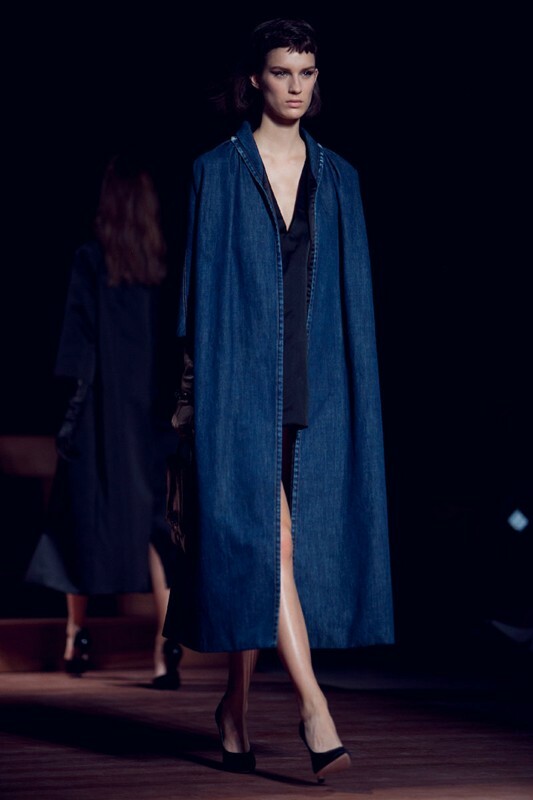 ACNE, well- known for its minimalism (it is a Scandinavian brand don't forget it) and Jeans, has proposed for its SS13 a collection turning around several themes with a main colour, Indigo, that transformed itself in denim as the show unravels. 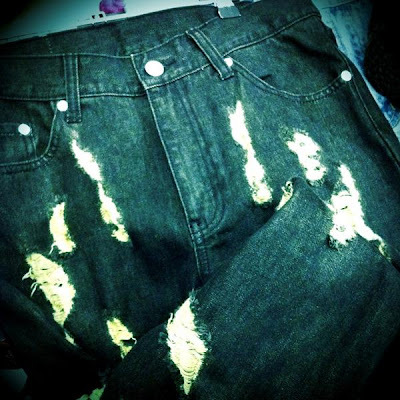 There are not many effects on the work of the denim. 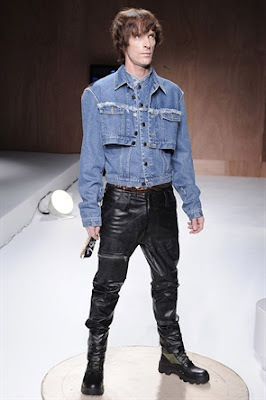 Denim is taken in its mere expression, in its basic version, with a jacket and oversized shorts that everyone could translate in its own fashion language, in its own wardrobe, to give it its own personality. The most striking use of Denim can be found in the latest MIU MIU Collection. 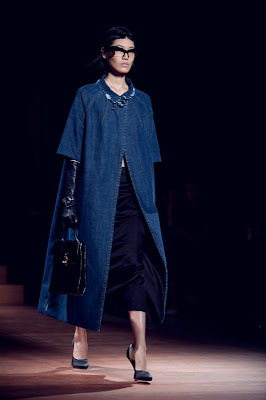 Miuccia Prada has completely digested the fact that denim is the uniform fabric above all. 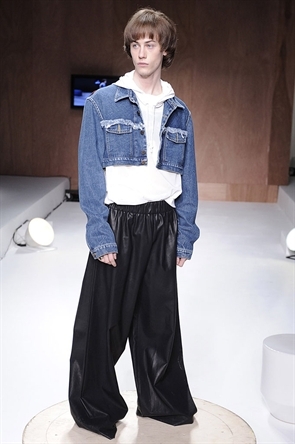 Indeed, she has translated this idea into an unconventional collection with oversized coats made of denim, high-waisted pencil skirts made of denim, cropped tops made of denim. Everything giving a very 50s inspiration. We can recognize the inspiration taken from the secretary's uniform. And this idea is even stronger because this is Denim! This show is about multiple effects, a mise en abyme because Ms Prada has played on this "grotesque" effect for secretaries do not wear and would not wear like that. On the contrary, this outfit would be perfect for anything but a day at the office. And there is nothing rigid, strict or stiff in this idea. 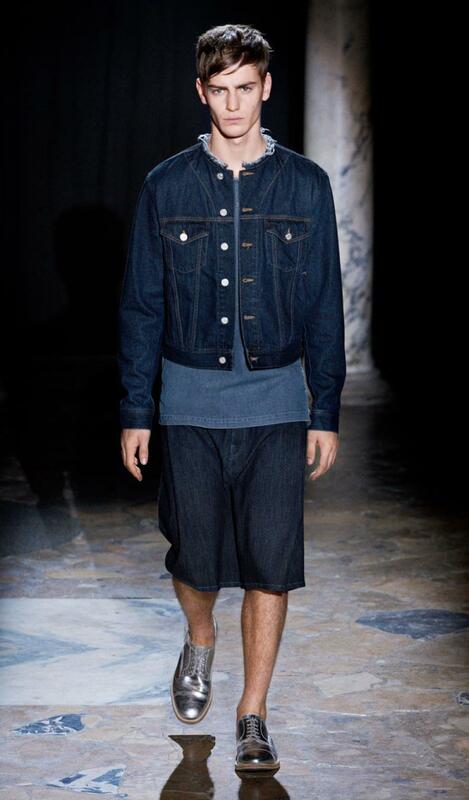 It is the most daring use of denim and certainly the perfect understatement. Just like Magritte's painting Ceci est une pipe, Miuccia Prada seems to tell us that this secretary uniform just looks like a secretary uniform and we have to look beyond. Are we only surprised this comes from the designer of Prada? This constant use of Denim season after season still ensures good times to this number one fabric. And judging by the teaser pictures Cheap Monday posted on its Twitter Account, before its show at the Mercedes Benz Fashion Week Stockholm we can see that the Swedish brand features once again gorgeous pieces made of Denim. We just cannot wait!